Spectators around the country are gearing up, eclipse glasses at the ready, for the big event on August 21. But another group -- perhaps more anxious than eager -- is preparing as well: the people who run California’s electric grid. California is home to almost half of all the solar power in the country. 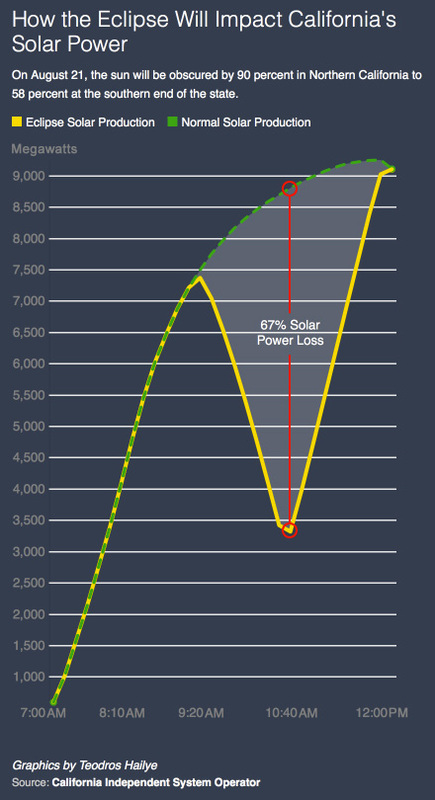 So even a partial loss of the sun will mean a major dip in the energy supply. California isn’t squarely in the path, but the moon's partial shadow will obscure 90 percent of the sun in the north, down to nearly 60 percent in the south. That’s more than enough to cause some anxiety for the people who have to keep California’s lights on. 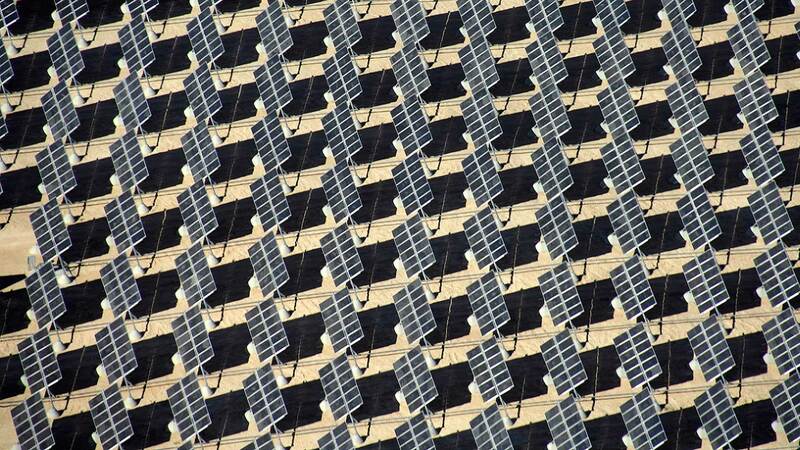 It’s unprecedented because solar power has been booming in California. Some days, it makes up as much as 40 percent of the state’s power supply. 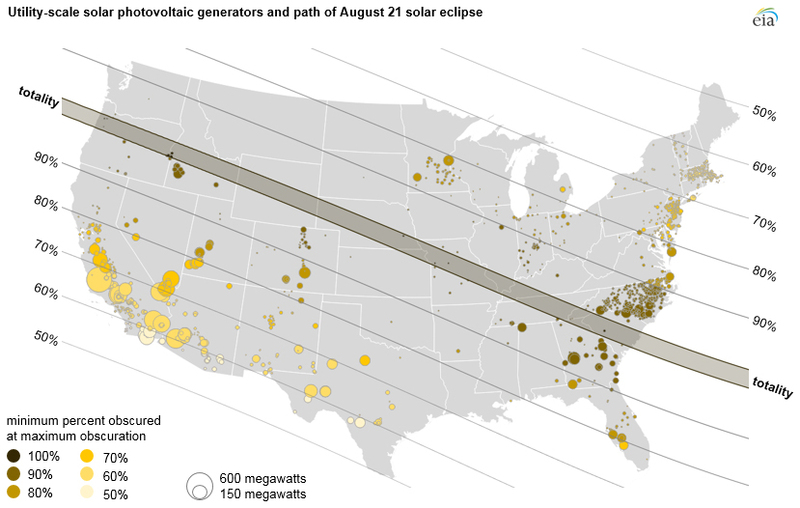 The eclipse will cut solar output roughly in half over the course of several hours. At the same time, hundreds of thousands of buildings -- both residential and commercial -- that normally count on rooftop solar will need to switch to grid power instead. Add that to the loss from big utility-scale solar farms and California will need to fill a power gap equal to what six million homes use. “Luckily, we had a really good water year this year,” Lyon says. “So we’ll have some pretty good flexibility on the hydro.” That wasn’t the case during the past few summers, when reservoirs were low due to the drought. What hydropower dams can’t make up, natural gas power plants will. That includes large power plants that can respond quickly, as well as smaller “peaker” plants. The California ISO is scheduling extra power ahead of time to try to ensure the needs are met and that power prices don’t spike. The tricky part is that the sun will disappear and reappear 2-to-3 times faster than normal, which means the grid will have to be balanced carefully. Supply always has to meet demand, otherwise, you get blackouts. Grid operators say they’re prepared because, with renewable energy on the rise, they've learned to deal with power dips every day. In recent years, the California ISO has beefed up its modeling and forecasting to handle the swings. Other leading solar states will see an effect, too. Duke Energy in North Carolina expects to lose about 90 percent of its solar supply, though it has about a quarter of what California uses. It plans to use natural gas power plants to fill in the gap. NV Energy in Nevada expects to see an even smaller dip. 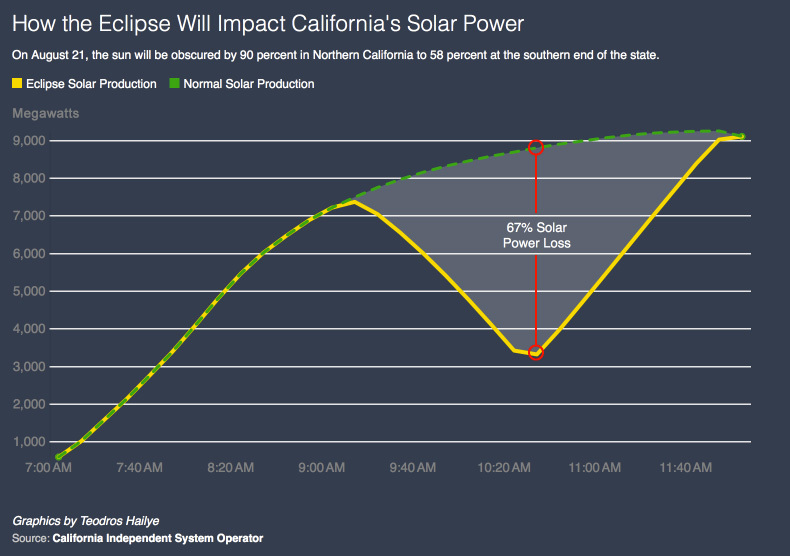 The next total eclipse, in 2024, could be an even bigger challenge for California and other states, when even more solar is in the mix. Energy officials are asking Californians to turn off lights and conserve energy for several hours on the morning of August 21, just to give the grid a little extra help.